High Speed Steel Saws Saws are constructed with a hardened high speed, M3 cutting edge welded to a tough, resilient alloy back. These deep hole saws cut any machinable material from wood and plastics to harder metals such as stainless steel. 1/4" diameter, high speed steel. Held by set screw in arbor body. Fits all hole saw arbors except M-24K. 1/4" diameter, high speed steel. Held by set screw in arbor body. Fits all hole saw arbors with thru holes in hex shanks. BORES LARGE, DEEP HOLES FAST. For plumbing rough-in work and many other uses. 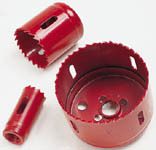 Sizes up to 2-9/16" feature a single inside cutter, and larger sizes feature two inside cutters.